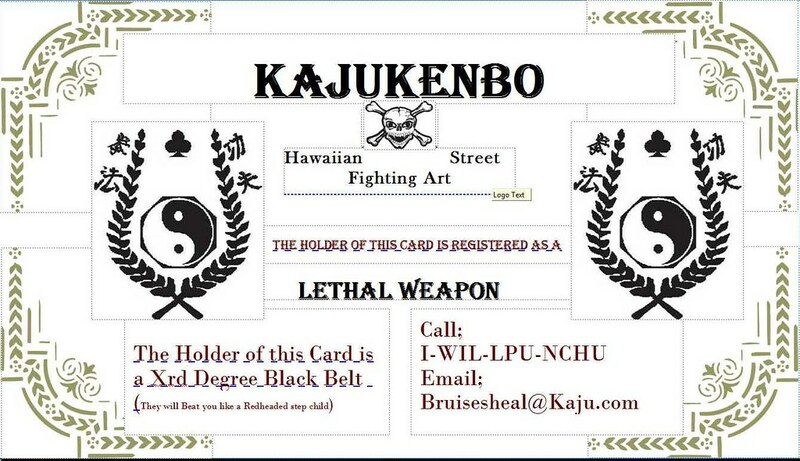 I've heard about once becoming a black belt you must register with the state or local police dept. that you're a "lethal weapon". Does this still exist today or is it some bull crap that people make up? I mean, in my logical thinking, why would I want to register myself to the government and let them know that I'm dangerous to the public? a few years back there was a guy who was giving my staff at the night club a hard time when he was asked for his ID at the door. standing there just being a fly on the wall I overheard him ask if they wanted to see his registration card as well. my door man asked him what do you mean registration card. he answered saying my hands are registered. I told myself well this should be fun. I followed him in to the club where he was strutting like Mr. cool. I walked up casually and asked if I had herd correctly that his hands were registered? and he said oh yeah I have to keep it on me at all times. so I asked if I could see it. after he puts up a real good search of his person he said I guess I left it at home. so I said no problem maybe the next time you come in you can bring it. he said yeah no problem. I then stepped to him eye to eye and told him and if you don't have it on you don't come back because I think your full of crap. and if you come back without it I am going to make you prove to me that your hands are registered. he just looked back at me with a dumb look and left the club never top be seen again. If you had to register your hands as leathel weapons, you would also have to have a permit to carry. Without it everytime you put your hands in your pocket you would be breaking the law by carrying a concealed weapon. He should have checked to see if his shorts were registered waste recepticles. Actually there may some truth to this rumor. When the Americans occupied Japan after the war many GIs, Sailors, and Marines started studying the martial arts while stationed there. They would then go into town and if you know how Grunts and alchohol mix together then you can imagine the outcome. Fights would ensue and the MPs would show up and hook people up and cart them off. Many service members were locked up so many times that the MPs had them register with them so that when they were brought in it would save time in doing paperwork. Thats where the whole "My hands are registered weapons" bit came about. Well at least thats the way it was told to me. If I was him, I would have moved to the Bolivian jungle just so there is no possibility of that meeting EVER happening. If this was true, I guess there's a lot of 9 year-old "deadly weapons" running around from what I've seen at some tournaments. Wonder if they're all registered? This is one of the oldest American martial arts legends, and thereâ€™s absolutely no basis for it. First, the U.S. government doesnâ€™t regulate the martial arts, which means thereâ€™s no process to identify people practicing the fighting arts and no governmental method by which practitioners can be evaluated. Such a feat of regulation would cost millions, if not billions, of dollars and be a violation of civil rights. Actually, thereâ€™s not a country on earth where martial artists are required to register themselves as weapons, deadly or otherwise. This myth has its roots in three different aspects of mid-20th-century history. In post-World War II Japan, the traditional arts were banned, and records were kept of experienced practitioners. It lasted only a few years and hasnâ€™t been repeated. It never spread beyond the borders of Japan. Another root is entrenched in the regulation of the activities of U.S. servicemen overseas. Occasionally, following World War II and even into the 1960s, military personnel who enrolled in martial arts programs were asked to register their participation, though not themselves. That was done to keep track of nonstandard combative training, to ensure that the servicemen were getting good instruction and to monitor those classes that were resulting in injuries to the men. Remember that when a person joins the military, heâ€™s essentially the property of the U.S. government, and engaging in activities that needlessly result in injury is like damaging military equipment. If a school was causing a lot of injuries, the military wanted to know about it and, in some cases, shut it down. The third root is planted in the soil of the rich and often outrageous history of professional pugilism. In the era of boxer Joe Louis, it was common to have police on hand during a press conference to â€œregisterâ€� the boxer as a deadly weapon. It was just a publicity stunt and carried no more legal weight than receiving the key to the city, which, of course, doesnâ€™t mean you can open any door in town and just walk inside. In court cases involving violent confrontations, lawyers and judges may advise the jury to bear in mind a personâ€™s martial arts, boxing or military training when evaluating the facts of the case, as in the Matter of the Welfare of DSF, 416 N.W.2d 772 (Minn. App. 1988), where the Minnesota Court of Appeals concluded that the defendant, who had â€œsubstantial experience in karate,â€� was aware enough of the potential of his blows to deliberately break the plaintiffâ€™s jaw. But that is a lot different from legally stating that the person in question is a registered and/or licensed deadly weapon. Whatâ€™s truly disturbing, however, is that some martial artists carry â€œregistration cardsâ€� theyâ€™ve received from their instructors. Those instructors charge them a hefty fee to be registered, and the students believe what theyâ€™ve been toldâ€”that theyâ€™re now listed as deadly weapons."